Mr Paulson has asked the team to examine “systemic risk posed by hedge funds and derivatives, and the government’s ability to respond to a financial crisis”. “We need to be vigilant and make sure we are thinking through all of the various risks and that we are being very careful here. Do we have enough liquidity in the system?” he said, fretting about the secrecy of the world’s 8,000 unregulated hedge funds with $1.3 trillion at their disposal. Among the massive programs implemented in response to the financial crisis was the Federal Reserve’s quantitative easing program, which began in November of 2008. A second quantitative easing program (QE 2) was initiated in November of 2010. The next program was “operation twist”. Last week, Jon Hilsenrath of the Wall Street Journal discussed the Fed’s plan for another bit of magic, described by economist James Hamilton as “sterilized quantitative easing”. All of these efforts by the Fed have served no other purpose than to inflate stock prices. This process was first exposed in an August, 2009 report by Precision Capital Management entitled, A Grand Unified Theory of Market Manipulation. More recently, on March 9, Charles Biderman of TrimTabs posted this (video) rant about the ongoing efforts by the Federal Reserve to manipulate the stock market. The bottom line is that near-term market direction is largely a throw of the dice, though with dice that are modestly biased to the downside. Indeed, the present overvalued, overbought, overbullish syndrome tends to be associated with a tendency for the market to repeatedly establish slight new highs, with shallow pullbacks giving way to further marginal new highs over a period of weeks. This instance has been no different. As we extend the outlook horizon beyond several weeks, however, the risks we observe become far more pointed. The most severe risk we measure is not the projected return over any particular window such as 4 weeks or 6 months, but is instead the likelihood of a particularly deep drawdown at some point within the coming 18-month period. As of last week, the market continued to reflect a set of conditions that have characterized a wicked subset of historical instances, comprising a Who’s Who of Awful Times to Invest . Barron’s ran a piece over the weekend that reviewed our case. It’s interesting to me that among the predictable objections (mostly related to our flat post-2009 performance, but overlooking the 2000-2009 record), none addressed the simple fact that the prior instances of this condition have invariably turned out terribly. It seems to me that before entirely disregarding evidence that is as rare as it is ominous, you have to ask yourself one question. Do I feel lucky? Investors Intelligence notes that corporate insiders are now selling shares at levels associated with “near panic action.” Since corporate insiders typically receive stock as part of their compensation, it is normal for insiders to sell about 2 shares on the open market for every share they purchase outright. Recently, however, insider sales have been running at a pace of more than 8-to-1. While investors and the economic consensus has largely abandoned any concern about a fresh economic downturn, we remain uncomfortable with the divergence between reliable leading measures – which are still actually deteriorating – and more upbeat coincident/lagging measures on which public optimism appears to be based. With the Standard & Poor’s 500 up 24% from the October lows, it may be a good time to take some chips off the table. THERE ARE AMPLE FUNDAMENTALS to knock the market down, including the well-advertised surge in gasoline prices, which Zimmermann calculates absorbed the discretionary spending power for half of America. And the escalating tensions over Iran’s nuclear program “is the gift that keeps on giving…if you like fear-inflated energy prices,” he wrote in the client letter. At the same time, “the euro-zone response to their deflationary debt trap continues to be further loans to the hopelessly indebted, in return for crushing austerity programs. The euro zone is (or was, he stresses) the world’s largest economy, and a buyer of 22% of U.S. exports, which puts the domestic economy at risk, he adds. Given the fact that the Federal Reserve has already expended the “heavy artillery” in its arsenal, it seems unlikely that the remaining bit of pixie dust in Ben Bernanke’s pocket – “sterilized quantitative easing” – will be of any use in the Fed’s never-ending efforts to inflate stock prices. Self-fulfilling expectations lie at the heart of the market monetarist theory. A depression occurs when people come to believe that income will be scarce relative to prior expectations and debts. They nervously scale back expenditures and hoard cash, fulfilling their expectations of income scarcity. However, if everybody could suddenly be made to believe that income would be plentiful, everyone would spend freely and fulfill the expectations of plenty. The world is a much more pleasant place under the second set of expectations than the first. And to switch between the two scenarios, all that is required is persuasion. The market-monetarist central bank is nothing more than a great persuader: when “shocks happen”, it persuades us all to maintain our optimism about the path of nominal income. As long as we all keep the faith, our faith will be rewarded. This is not a religion, but a Nash equilibrium. Pacific Investment Management Co.’s Chief Executive Officer Mohamed A. El-Erian said U.S. economic conditions are “terrifying” as the nation struggles to recover from recession. The odds of the U.S. returning to recession are as much as 50 percent, El-Erian said during an interview on Bloomberg Television’s “In the Loop” with Betty Liu. U.S. economic growth was worse than expected and congressional policy makers are gridlocked over what to do about the economy and the deficit, which risk exacerbating an already weak recovery, he said. “We have less economic momentum than we thought we had and we have no policy momentum,” said El-Erian, who also serves as co-chief investment officer with Pimco founder Bill Gross at the world’s largest manager of bond funds. Let’s not forget that all of this is happening at a time when we are plagued by the most dysfunctional, stupid and corrupt Congress in our nation’s history. President Obama is currently preoccupied with his re-election campaign. His own leadership failures are conveniently re-packaged as products of that feckless Congress. As a result, Americans have plenty of justification for being worried about the future. So don’t kid yourself folks, recent economic and market “ugliness and violence” not only won’t end soon, it’ll get meaner and meaner for years after 2012 elections … no matter who wins. Only a fool would believe that a new bull market will take off in 2013. Ain’t going to happen. That’s a Wall Street fantasy. Fall for that, and you’re delusional. In fact, you better plan on a very long secular bear the next decade through 2020. With the European banks, credit and currency on the edge of a global financial meltdown, there’s a high probability that a black swan virus, a contagion will sweep the world, making all investing “uglier” and more “violent” for Americans in 2013, indeed for the rest of the decade. Shilling sees “a secular bear market really started in 2000 and may persist for a decade as a result of slower GDP growth,” yes, persist till 2020 “with 2% to 3% deflation.” He warns: “Nominal GDP might not gain at all,” like recent flat-lining. Which coincides with the expectations of America’s professional financial advisers. 30+ years of lawless behavior has now devolved down to blatant, in-your-face theft. They don’t even bother trying to hide it any more, and Eric “Place” Holder is too busy supervising the running of guns into Mexico so the drug cartels can shoot both Mexican and American citizens. What am I, or anyone else, supposed to do in this sort of “market” environment? Invest in…. what? Land titles are worthless as they’ve been corrupted by robosigning, margin deposits have been stolen, Madoff’s clients had confirmations of trades that never happend and proved to worthless pieces of paper instead of valuable securities and while Madoff went to prison nobody else has and the money is still gone! Without enforcement of the law — swift and certain — there is no deterrent against this behavior. There has been no enforcement and there is no indication that this will change. It’s coming folks, and I guarantee you this: Whatever your “nightmare” scenario is for such an event, it’s not bearish enough. Keep all of this in mind as you plan for the future. I would not expect that you might hear any of this on CNBC. At the conclusion of a single, five-year term as Chair of the Federal Deposit Insurance Corporation (FDIC) Sheila Bair is calling it quits. One can hardly blame her. It must have been one hell of an experience: Warning about the hazards of the subprime mortgage market, being ignored and watching the consequences unfold . . . followed by a painful, weekly ritual, which gave birth to a website called Bank Fail Friday. This past week, the FDIC adopted a rule that allows the agency to claw back two years’ worth of compensation from senior executives and managers responsible for the collapse of a systemic, non-bank financial firm. To date, the FDIC has authorized suits against 248 directors and officers of failed banks for shirking their fiduciary duties, seeking at least $6.8 billion in damages. The rationales the executives come up with to try to escape accountability for their actions never cease to amaze me. They blame the failure of their institutions on market forces, on “dead-beat borrowers,” on regulators, on space aliens. They will reach for any excuse to avoid responsibility. Mortgage brokers and the issuers of mortgage-based securities were typically paid based on volume, and they responded to these incentives by making millions of risky loans, then moving on to new jobs long before defaults and foreclosures reached record levels. For instance, during the peak of the crisis, with credit markets largely frozen, banks found themselves unable to roll over their short-term debt. This made it virtually impossible for them to function. Geithner wanted the F.D.I.C. to guarantee literally all debt issued by the big bank-holding companies – an eye-popping request. Bair said no. Besides the risk it would have entailed, it would have also meant a windfall for bondholders, because much of the existing debt was trading at a steep discount. “It was unnecessary,” she said. Instead, Bair and Paulson worked out a deal in which the F.D.I.C. guaranteed only new debt issued by the bank-holding companies. It was still a huge risk for the F.D.I.C. to take; Paulson says today that it was one of the most important, if underrated, actions taken by the federal government during the crisis. “It was an extraordinary thing for us to do,” Bair acknowledged. Last June, with a financial hurricane gathering force, Treasury Secretary Henry M. Paulson, Jr. convened the nation’s economic stewards for a brainstorming session. What emergency powers might the government want at its disposal to confront the crisis? he asked. Timothy F. Geithner, who as president of the New York Federal Reserve Bank oversaw many of the nation’s most powerful financial institutions, stunned the group with the audacity of his answer. He proposed asking Congress to give the president broad power to guarantee all the debt in the banking system, according to two participants, including Michele Davis, then an assistant Treasury secretary. The proposal quickly died amid protests that it was politically untenable because it could put taxpayers on the hook for trillions of dollars. But in the 10 months since then, the government has in many ways embraced his blue-sky prescription. Step by step, through an array of new programs, the Federal Reserve and Treasury have assumed an unprecedented role in the banking system, using unprecedented amounts of taxpayer money, to try to save the nation’s financiers from their own mistakes. Geithner’s utter contempt for market discipline again became a subject of the Nocera-Bair interview when the conversation turned to the infamous Maiden Lane III bailouts. “Isn’t that ridiculous?” she said. This article by Gretchen Morgenson provides more detail about Geithner’s determination that AIG’s counterparties receive 100 cents on the dollar. For Goldman Sachs – it amounted to $12.9 billion which was never repaid to the taxpayers. They can brag all they want about paying back TARP – but Maiden Lane III was a gift. “I think the president’s heart is in the right place,” Bair told me. “I absolutely do. But the dichotomy between who he selected to run his economic team and what he personally would like them to be doing – I think those are two very different things.” What particularly galls her is that Treasury under both Paulson and Geithner has been willing to take all sorts of criticism to help the banks. But it has been utterly unwilling to take any political heat to help homeowners. If Sheila Bair’s concern is valid, the Obama administration’s track record for market discipline has us on a certain trajectory for another financial crisis. After establishing an economic advisory team consisting of retreads from the Clinton White House, President Obama has persisted in approaching the 2010 economy as though it were the 1996 economy. Clinton’s success was a function of a roaring economy. The late ‘90s were a boom time like few others — and not just in America. The unemployment rate was less than 6 percent in 1995, and fell to under 5 percent in 1996. Cutting deficits was the right thing to do at that time. Deficits should be low to nonexistent when the economy is strong, and larger when it is weak. The Obama administration’s economists know that full well. They are, after all, the very people who worked to balance the budget in the 1990s, and who fought to expand the deficit in response to the recession. Right now, the economy is weak. Giving into austerity will weaken it further, or at least delay recovery for longer. And if Obama does not get a recovery, then he will not be a successful president, no matter how hard he works to claim Boehner’s successes as his own. To reduce federal government spending by $38 billion in the second and third quarters of 2011 when the unemployment rate is 8.9% and the U.S. Treasury can borrow on terms that make pulling spending forward from the future into the present essentially free is not an accomplishment. It will knock between 0.5% and 1.0% off the growth rate of real GDP in the second half of 2011, and leave us at the start of 2012 with an unemployment rate a couple of tenths of a percent higher than it would have been otherwise. “We preserved the investments we need to win the future,” he said last night. That’s not true. And in 2008 our government was convinced by Timothy Geithner, Hank Paulson and Ben Bernanke that if we just saved the banks we would fix the economy. So we embarked on the “recovery” plan that has led us to one of the weakest recoveries in US economic history. Because of the keen focus on the banking system there is a clear two tier recovery. Wall Street is thriving again and Main Street is still struggling. Thus far, we have run budget deficits that have been large enough to offset much of the deleveraging of the private sector. And though the spending was poorly targeted it has been persistent enough that we are not repeating the mistakes of Japan – YET. By my estimates the balance sheet recession is likely to persist well into 2013. QE2 has truly been a “monetary non-event”. As many of us predicted at its onset, this program has shown absolutely no impact on the US money supply (much to the dismay of the hyperinflationists). And now its damaging psychological impact (via rampant speculation) has altered the options available to combat the continuing balance sheet recession. While more stimulus is almost certainly off the table given the Fed’s misguided QE2 policy, it would be equally misguided to begin cutting the current budget deficit. Sizable cuts before the end of the balance sheet recession will almost guarantee that the US economy suffers a Japan-like relapse. It’s not too late to learn from the mistakes of Japan. Will the Obama administration’s “failure of nerve” – by avoiding bank nationalization – send us into a ten-year, “Japan-style” recession? It’s beginning to look that way. Two years down – eight years to go. 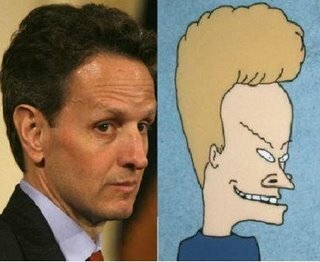 Is it just a coincidence that “Turbo” Tim Geithner was the subject of back-to-back feature stories in The New Yorker and The Atlantic ? A number of commentators don’t think so. The March 10 issue of The New Yorker ran an article by John Cassidy entitled, “No Credit”. The title is meant to imply that Getithner’s efforts to save America’s financial system are working but he’s not getting any credit for this achievement. From the very outset, this piece was obviously an attempt to reconstruct Geithner’s controversial public image – because he has been widely criticized as a tool of Wall Street. But in the 10 months since then, the government has in many ways embraced his blue-sky prescription. During the past ten months, U.S. banks have raised more than a hundred and forty billion dollars from investors and increased the reserves they hold to cover unforeseen losses. While many small banks are still in peril, their larger brethren, such as Bank of America, Wells Fargo, and Goldman Sachs, are more strongly capitalized than many of their international competitors, and they have repaid virtually all the money they received from taxpayers. Looking ahead, the Treasury Department estimates the ultimate cost of the financial-rescue package at just a hundred and seventeen billion dollars — and much of that related to propping up General Motors and Chrysler. But the Obama administration miscalculated badly. First, it bought the financiers’ false promise that massive subsidies to them would kick start the economy. But economists are now estimating that it is likely to take five years to return to pre-crisis levels of unemployment. Obama took his eye off the ball. A Democratic President’s most important responsibility is job creation. It is simply unacceptable to most Americans for Wall Street to be reaping record profits and bonuses while the rest of the country is suffering. Second, it assumed finance was too complicated to hold the attention of most citizens, and so the (non) initiatives under way now would attract comparatively little scrutiny. But as public ire remains high, the press coverage has become almost schizophrenic. Obvious public relations plants, like Ben Bernanke’s designation as Time Magazine’s Man of the Year (precisely when his confirmation is running into unexpected opposition) and stories in the New York Times that incorrectly reported some Goldman executive bonus cosmetics as meaningful concessions have co-existed with reports on the abject failure of Geithner’s mortgage modification program. While mainstream press coverage is still largely flattering, the desperation of the recent PR moves versus the continued public ire and recognition of where the Administration’s priorities truly lie means the fissures are becoming a gaping chasm. So with Obama’s popularity falling sharply, it should be no surprise that the Administration is resorting to more concerted propaganda efforts. It may have no choice. Having ceded so much ground to the financiers, it has lost control of the battlefield. The banking lobbyists have perfected their tactics for blocking reform over the last two decades. Team Obama naively cast its lot with an industry that is vastly more skilled in the dark art of the manufacture of consent than it is. Congratulations to Yves Smith for writing a fantastic critique of the Obama administration’s combination of nonfeasance and misfeasance in responding to both the financial and economic crises. The first day of hearings conducted by the Financial Crisis Inquiry Commission (FCIC) was as entertaining as I expected. The stars of the show: Lloyd Blankfein of Goldman Sachs, John Mack of Morgan Stanley, “The Dimon Dog” of JP Morgan Chase and Brian Moynihan from Bank of America presented themselves as likeable guys. However, in the case of Blankfein, whenever he wasn’t talking he would sit there with that squinting, perplexed look on his face that seemed to mime the question: “WTF?” A large segment of the viewing public has already been primed to view these gentlemen as “The Four Horsemen of The Financial Apocalypse”. Nevertheless, there were four more Horsemen absent from the “stage” on Wednesday: Messrs. Greenspan, Bernanke, Paulson and Geithner. Beyond that, Brian Moynihan didn’t really belong there, since he was not such a significant “player” as the other panel members, in events of 2008. In fact, history may yet view his predecessor, Ken Lewis, as more of a victim in this drama, due to the fact that he was apparently coerced by Hank Paulson and Ben Bernanke into buying Merrill Lynch with instructions to remain silent about Merrill’s shabby financial status. I would have preferred to see Vikram Pandit of Citigroup in that seat. As I watched the show, I tried to imagine what actors would be cast to play which characters on the panel in a movie about the financial crisis. Mike Myers would be the obvious choice to portray Lloyd Blankfein. Myers could simply don his Dr. Evil regalia and it would be an easy gig. The Dimon Dog should be played by George Clooney because he came off as a “regular guy”, lacking the highly-polished, slick presentation one might expect from someone in that position. Brian Moynihan could be portrayed by Robin Williams, in one of his rare, serious roles. John Mack should be portrayed by Nicholas Cage, if only because Cage needs the money. Although many reports have described their demeanor as “contrite”, the four members of the first panel gave largely self-serving presentations, characterizing their firms in the most favorable light. Blankfein emphasized that Goldman Sachs still believes in marking its assets to market. As expected, his theme of “if we knew then what we knew now . . .” got heavier rotation than a Donna Summer record at a party for Richard Simmons. John Mack, who was more candid and perhaps the most contrite panel member, made a point of mentioning that some assets cannot be “marked to market” because there really is no market for them. Excuse me . . . but isn’t that the definition of the term, “worthless”? Throughout the session, the panel discussed the myriad causes that contributed to the onset of the financial crisis. Despite that, nobody seemed interested in implicating the Federal Reserve’s monetary policy as a factor. “Don’t bite the hand that feeds you” was the order of the day. All four panelists described the primary cause of the crisis as excessive leverage. They acted as a chorus, singing “Lev Is The Drug”. Lloyd Blankfein repeatedly expressed pride in the fact that Goldman Sachs has always been leveraged to “only” a 23-to-1 ratio. The Dimon Dog’s theme was something like: “We did everything right . . . except that we were overleveraged”. Dimon went on to make the specious claim that overleveraging by consumers was a contributing element in causing the crisis. Although many commentators whom I respect have made the same point, I just don’t buy it. Why blame people who were led to believe that their homes would continue to print money for them until they died? Dimon himself admitted at the hearing that no consideration was ever given to the possibility that home values would slump. Worse yet, for a producer or purveyor of the so-called “financial weapons of mass-destruction” to implicate overleveraged consumers as sharing a role in precipitating this mess is simply absurd. The second panel from Wednesday’s hearing was equally, if not more entertaining. Michael Mayo of Calyon Securities seemed awfully proud of himself. After all, he did a great job on his opening statement and he knew it. Later on, he refocused his pride with an homage to his brother, who is currently serving in Iraq. Nevertheless, the star witness from the second panel was Kyle Bass of Hayman Advisors, who gave the most impressive performance of the day. Bass made a point of emphasizing (in so many words) that Lloyd Blankfein’s 23-to-1 leverage ratio was nearly 100 percent higher than what prudence should allow. If you choose to watch the testimony of just one witness from Wednesday’s hearing, make sure it’s Kyle Bass. I didn’t bother to watch the third panel for much longer than a few minutes. The first two acts were tough to follow. Shortly into the opening statement by Mark Zandy of Moody’s, I decided that I had seen enough for the day. Besides, Thursday’s show would hold the promise of some excitement with the testimony of Sheila Bair of the FDIC. I wondered whether someone might ask her: “Any hints as to what banks are going to fail tomorrow?” On the other hand, I had been expecting the testimony of Attorney General Eric Hold-harmless to help cure me of the insomnia caused by too much Cuban coffee. The Commissioners themselves have done great work with all of the witnesses. Phil Angelides has a great style, combining a pleasant affect with incisive questioning and good witness control. Doug Holtz-Eakin and Brooksley Born have been batting 1000. Heather Murren is more than a little easy on the eyes, bringing another element of “star quality” to the show. Who knows? This commission could really end up making a difference in effectuating financial reform. They’re certainly headed in that direction.